Regardless of whether it's on a blog or on social media, there is an overwhelming need for acknowledgement and reciprocation. Without comments, the world is a bland, barren and lonely place. You post your heart out, hoping to capture the attention of your audience, and all you hear are crickets! How easy is it for people to give you comments? On social media the process is obvious, but on blogs sometimes the hurdles readers have to go through to leave a comment can be very off-putting. Even though moderation doesn't happen on social media, this is necessary on blogs because of spam. However, really good spam blockers can reduce this problem significantly. 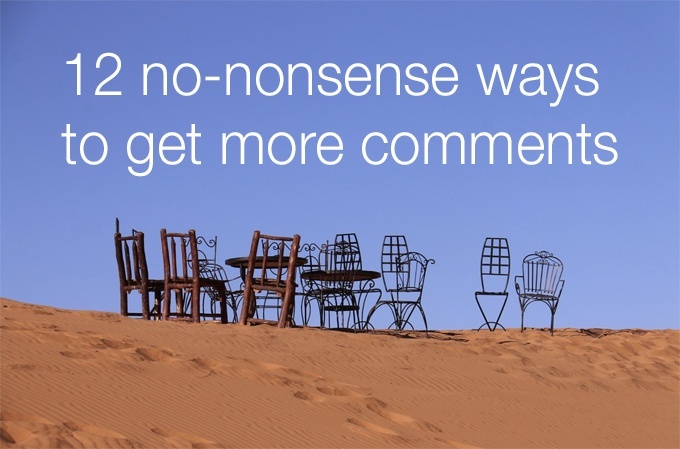 So look at how your comment box performs to assess how to make it easier to get more comments. And how instantly findable is your comments box – that could also be a factor. The old adage "If you don't ask, you don't get" comes into play here. The simplest call to action at the bottom of a post is to ask you readers to leave a comment. You can't expect every reader to have the nonce to think "Oh, I'll write a comment about that", as they probably won't. For some people this just won't even occur to them. So a quick request for a comment could go a long way to receiving one. And you could make it easier by suggesting things they could write about, to increase the odds of a reasonable response. Not only is it nice and polite to reply to any comments you receive, it also has the added benefit of doubling the amount of comments you have! This is a sneaky trick to make you seem more popular. Seriously, your readers aren't going to come back and comment again if they feel you don't appreciate the effort they have made. Your comments will need plenty of encouragement to keep them happy and satisfied. And displaying many comments suggest popularity, which results in more comments. If it appears you have lots of readers, this will seem more attractive to others who will wonder why the blog or social media discussion is so attractive. If you write posts that are too perfect, there will be no reason for anyone to write a comment. This is especially so if you have taken great pains to explore every aspect of the argument. Or completed your research to the nth degree so there is nothing more to add to enhance the post. Therefore it is necessary to leave a 'hole' which your readers could fill through commenting. Give them an excuse to look for the commenting box, so they have the opportunity to write their point of view. This is particularly so for educational posts. It may seem necessary to cram in as much information as possible. Whereas you might fare better if you leave out the obvious to enable your readers to remind you about it. The writers who are most successful at getting more comments are those that dare to be controversial. Those who are brave enough to explore a particular subject or make claims that arouse attention. There are always going to be some areas of conversation that provoke certain reactions from the audience. If this is carefully managed, it could result in a lively and most satisfying discussion. However, this tactic could result in undesirable comments from the wrong kind of readers, so care is needed to manage this where no moderation is available to regulate the comments. This is a cousin of the controversial statement, but is much less dangerous. Questions have always aroused interest from readers, particularly if it relates to a need or problem. A question cannot be ignored as much as a statement. There is some innate response that forces people to search (subconsciously) for an answer. And if they have one, they are much more likely to put it in a comment. The art is to follow up with excellent, relevant content that clarifies or expands on the question. But still leaves enough of a gap to encourage an answer from readers via the comment box. Revealing your vulnerability immediately makes you more relatable to your audience. If they can see or imagine a connection to what you have written, you're more than half way there. There is something about relating a story about an experience you once had, that makes people comment about something similar. This is why it needs to be believable and something everyone can be connected to in some way or other. Showing you are only human is a sure-fire way of getting your readers on your side. And once they feel comfortable with you (and the subject), this will certainly result in more comments. Popularity is always a crowd puller. And the more people you have reading your content, the more likely you are to get more comments. Therefore it's worth doing research into what people want to read about, or find out what is trending at the moment, to take advantage of this popularity and ride its wave. And the more comments you get, the more popular you will appear to be, which is both attractive to more readers as well as the search engines. This in turn will put you in front of more readers, and so the cycle continues. The process of commenting is not a one-way ticket. You have to give in order to receive. Therefore it is necessary for you to get out there and find some posts to comment on yourself. The act of commenting can draw attention to yourself, as long as you are doing it correctly. Being appreciative, helpful and totally relevant to the original post will stand you in good stead, especially if you want to enhance the content through your comment. This is not an opportunity to write too much, or you may undermine the post's author. Also commenting is not a vehicle for self-promotion. It is meant to continue the conversation and help expand on the subject to educate and entertain other readers. If you are lucky enough to have an avid readership, the next best thing to do is to create a community. Here will be a collection of like-minded readers who could regularly comment on your content. Culturing their loyalty would result in more comments, which in turn gives the impression of popularity (see No 8 above). This community could also provide feedback and suggestions, which enables you to write more about what they want to read (and therefore comment on). Having this loyal readership by your side could help you to 'police' any undesirable commenters and trolls. There is always power in numbers, as well as the camaraderie to encourage the benefits of conversation and communication. One way to gather comments is to give away something your readers cannot resist. However, to be eligible for such a prize, they need to comment in order to receive it. This may seem a bit cheeky, but actually it is a great way of getting more comments. It could also encourage excellence and relevance as qualities that gives the commenter a better chance of winning. This is very similar to a tactic that only unlocks more valuable content if the reader shares the post. This way both parties win, which can only be a good thing. When the eminent bloggers saw the error of their ways and reopened their commenting facilities again, they needed to find a way to combat the amount of spam they had been getting. One way was to limit the amount of time their readers had to comment after a post had been published. This meant there was only a small window to get all the comments in before this opportunity became unavailable. This sense of urgency worked, as regular readers rushed to have their say before the system closed comments again for that post. And the spammers were thwarted, as they tended to find the post months later, when it was all to late. How do you get more comments? What methods do you use to get more comments on your blog or on social media? Have I managed to include all of them, or do you have more ideas and tips up your sleeve? Sometimes I share the post link with someone I know has an interest in that topic. This may even be the person who inspired the post in the first place! It doesn’t always result in a comment on the post, but I’ve done my best to try and continue the conversation. I’d not thought of leaving something out of a post. That’s interesting! Will have a ponder on my next post if that’s relevant for that topic, as I’m sure it may not work for every post. Thank you Tracey-Jane for your comment. Leaving something out of a post is a tricky thing to do. It’s difficult to work out which element your readers would realise was missing and would inspire them to comment! I always feel I need to include everything to educate my readers fully, so deliberately missing a point is very hard for me. Phew! That makes me feel like it’s OK to feel like that. Thanks Alice for sharing.